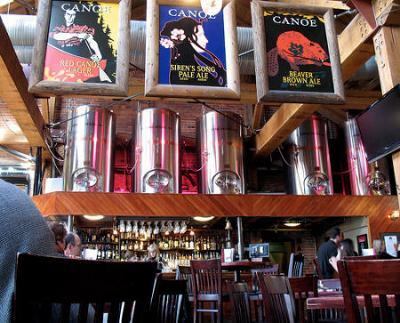 Situated waterfront in Victoria, BC, is the always popular brew pub/restaurant Canoe. While the choice of locally crafted beer can be overwhelming as well as the varied menu options, stick to what's simple. Skip the oh-so-popular Poutine (fries smothered with gravy and cheese curds) and start off with a halibut taco for an appetizer -- homemade soft tortillas stuffed with fresh halibut and all the proper accoutrements. Other great starters include their seafood chowder. While this place has standard pizza and burger fare, (it is after all a brewery) you can up the ante a bit by trying the shortrib and bluecheese burger or if you need something lighter, try the salmon club. You won't be disappointed. Education is the methods by which a man can get learning yet it ought not to be limited to perusing essaywritingservices-help.blogspot.com reading material just. There ought to be down to earth presentation to improve the aptitudes and identity of a man. Great review of the food to be found at this eatery, but I found it ironic that there was no mention of the beer... at a brewpub! Surely, there is some kind of recommendation along those lines? Anyone else have any input on the microbrews to be found at Canoe?